The iconic Traveller WW.TC opts for an intense black look. The new Titanium DLC version stands out with its strong character and a high degree of sophistication. 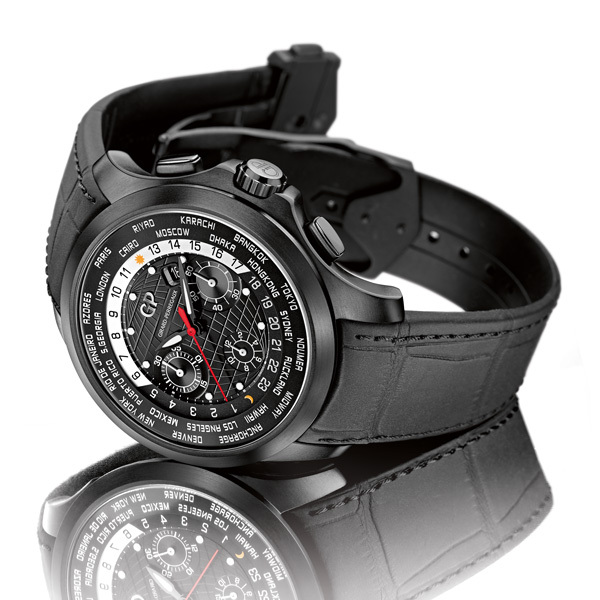 Its highly technical case houses a manufactured mechanical movement offering world times and chronograph functions. 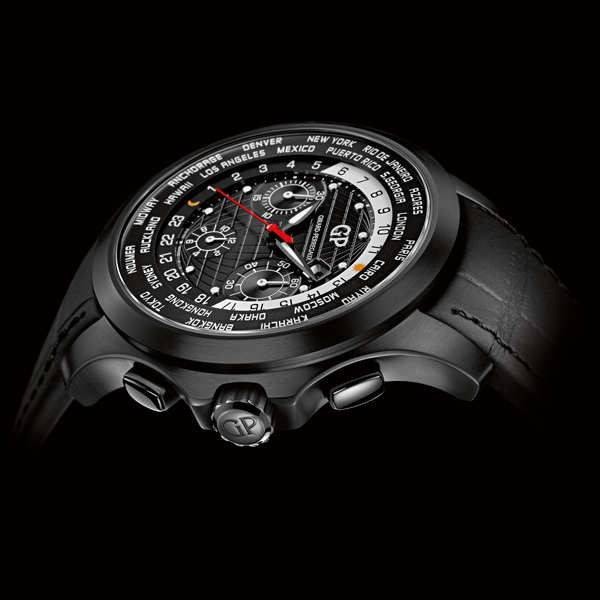 With its deep black tones, the Traveller WW.TC Titanium DLC offers a combination of high performance and understatement. It presents itself as the ideal contemporary traveling companion, thanks to its world time function, which enables the wearer to instantly know the time anywhere in the world. Its chronograph function, with its coal black hue and its specially rubber treated alligator textured strap highlight its sporting and technical character. 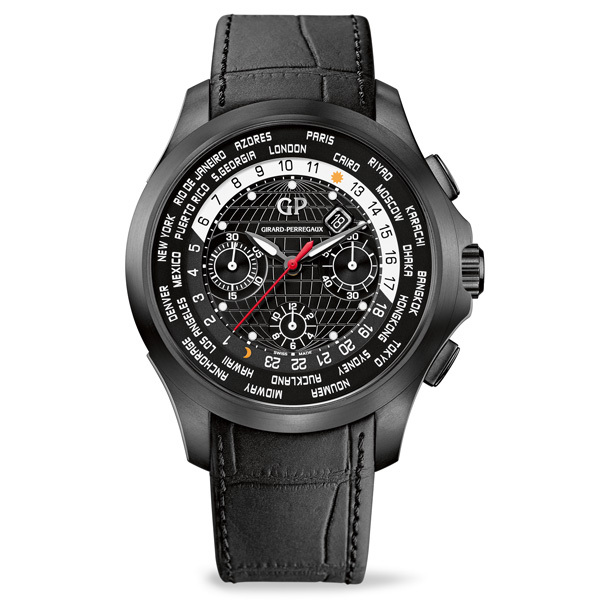 The center of the dial in the Traveller WW.TC Titanium DLC watch features a three-dimensional representation of the latitudes and longitudes covering the Earth. Uniformly black, this serves as a backdrop to the hours and minutes displays. Both the hands and the hour-markers aid the cause of those who make time their ally, since their luminous coatings make them visible day and night. Designed to capture the shortest snatches of time, the chronograph is equipped with a bright red central seconds hand, with its minutes and hours marked by two separate counters at 9 o'clock and 6 o'clock. Practical and easy to read, the world time function is displayed on the perimeter of the dial thanks to a first ring indicating both the hours and the periods of day and night. It is constantly in motion and completes a full revolution in 24 hours. An outer second ring is static, and shows the 24 different time zones that divide up the planet. The time in a particular place can be read instantly thanks to the numeral next to the city concerned. A sophisticated and practical solution, the single crown at 3 o’clock can control all its functions. With 30 different parts, the 44mm diameter case is carved out of titanium, known for its combination of solidity and lightness. Its black inky color is the result of its special diamond-like carbon surface treatment. With the dial protected by a wide, highly resistant sapphire crystal, the case back is held in place by 6 screws and also includes a sapphire crystal aperture to reveal the watch's caliber. 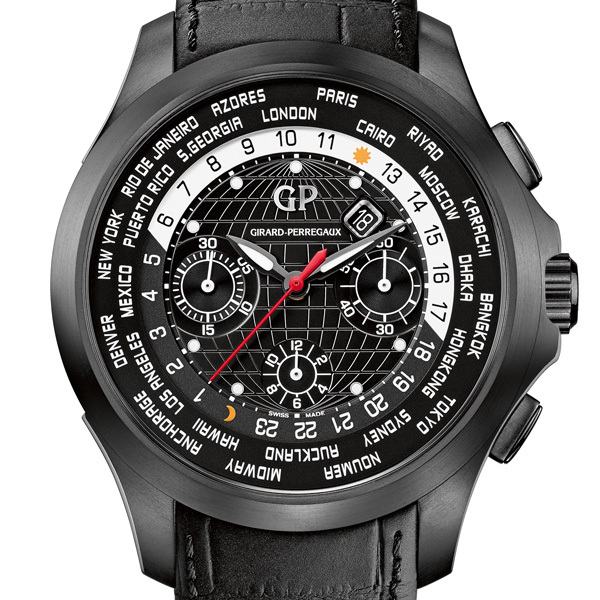 The GP03300 self-winding mechanical movement was developed by Girard-Perregaux engineers and watchmakers. 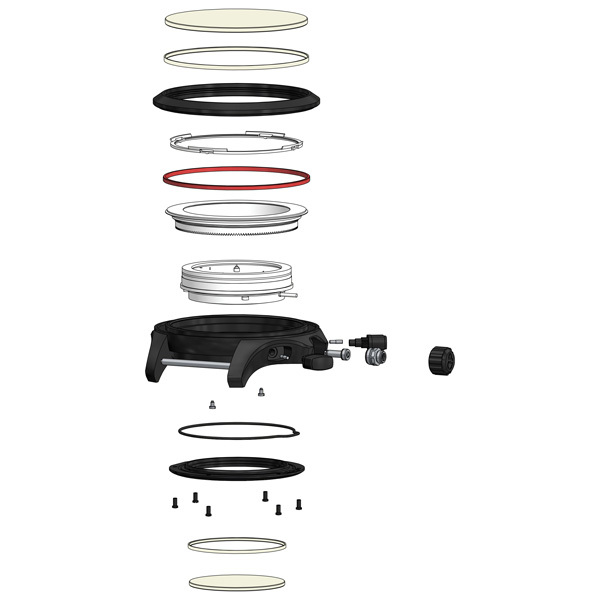 Produced, assembled and adjusted at the Manufacture, it includes 476 different parts. Equipped with a 46-hour power reserve, it beats at a frequency of 28,800 vibrations per hour (4 HZ) and offers hour, minute, small second, chronograph and date functions as well as world times with day/night indicator.